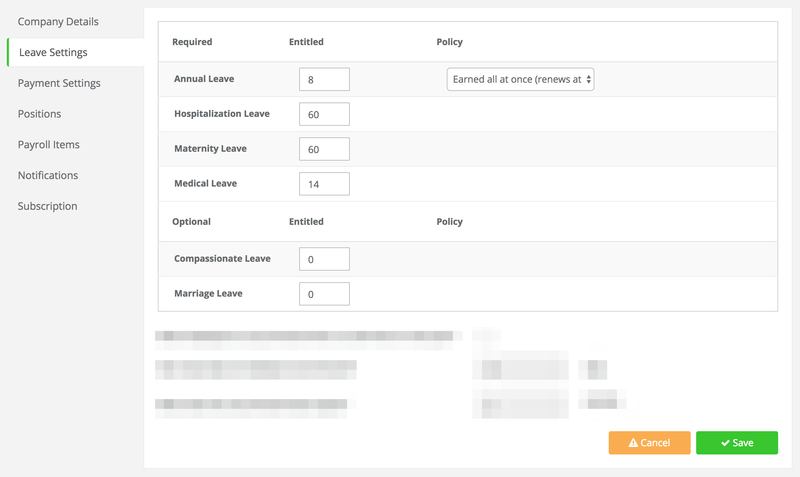 PayrollPanda — How to set default Leave entitlement? Help Center Home App How to set default Leave entitlement? Setting your company's default leave entitlement is very simple. 2. You can set default leave entitlement simply by filling out the "Entitled" values and then clicking the "Save" button at the bottom of the page. PayrollPanda has provided the recommended minimum as set by Ministry of Human Resources (Malaysia). Please refer to this document for more information. Default leave entitlement values only affect new employees created after these values have been set AND employees who were created before these values were set but for whom you haven't customized their leave entitlement at employee level. Example: Employee A & B and C have 12 annual leave days by default. For employee A I change it to 15 annual leave days under employee settings. Then I change default leave entitlements to 25 annual leave days, only Employee B & C will be updated. To change leave entitlement for a single employee, please read this help article. Also read: How to enable and setup carry forward Leave?